Indeed, there’s no magic number for clearing the snow off your roof — but if it helps to have a ballpark figure, experts recommend clearing off the snow at a height of approximately 18 inches. This is especially true for homes with a low-pitched roof. As a rule of thumb, roofs that are steep and pitched tend to hold snow less than roofs that are flat. Weight is a factor in determining a roof’s snow capacity, too. Light, fluffy, dry snow weighs considerably less than wet, heavy snow. In terms of weight, six inches of wet snow equates to a yard of dry snow. While factors like your roof’s age and building materials affect its ability to support extra weight, most roofs can hold up to 20 pounds of snow per square foot. For an approximation, 10 inches of snow equals about five pounds of snow. So a new, sturdy roof can hold roughly four feet of snow! 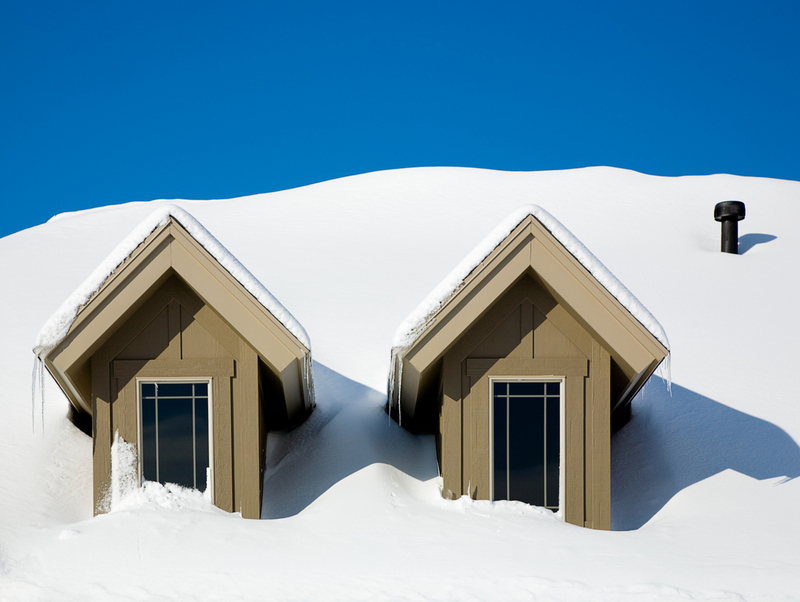 There are several hazards associated with removing snow from your roof. The first is your own safety. Climbing up on your roof is hazardous by nature — add in a steep slope plus slippery snow or ice, and you have a recipe for disaster. Accidents and mishaps from rooftop snow removal are so common that the Federal Emergency Management Agency (FEMA) warns that quite often, attempting to remove snow from a roof causes more harm than good. In addition to just posing a slip-and-fall risk, your roof can be dangerous if there is underlying structural damage that you can’t see. Before going out to the roof to clear it off, you can check inside for signs of damage. Go up to the attic and check to see if the rafters are bent or swayed. If you notice any leaks, there may be a crack in the roof, and it will be unsafe to climb up. Finally, everyone worries about how much snow their roof can sustain after a storm. If the roof is in good condition, it can hold a surprisingly high volume of snow. Remember that wet, heavy snow weighs much more than lighter snow. Therefore, you should clear off accumulating wet snow to prevent roof damage. When in doubt, always call a professional to help out! Are you looking for a helping hand to safely remove that snow? The professionals at Landmark Exteriors are just a call away! Contact us at 203-838-3838 and we can help take care of the problem with ease!